﻿ Maison Ambre Guesthouse Windhoek. JIMAT di Agoda.com! Ada soalan mengenai Maison Ambre Guesthouse? Ketika melawat Windhoek, anda akan merasa seperti di rumah di Maison Ambre Guesthouse, yang menawarkan penginapan berkualiti dan perkhidmatan hebat. Hanya 2.0 Km dari pusat bandar, lokasi strategik hotel memastikan tetamu boleh ke mana-mana sahaja dengan cepat dan mudah ke tempat-tempat tarikan. Syurga untuk berehat dan bersantai, hotel ini akan menawarkan pembaharuan penuh hanya beberapa langkah dari pelbagai daya tarikan bandar seperti Istana Schwerinsburg, Istana Sanderburg, Maerua Mall. Di Maison Ambre Guesthouse, segala usaha dilakukan untuk membuatkan tetamu berasa selesa. Oleh yang demikian, hotel ini menyediakan perkhidmatan dan kemudahan yang terbaik. Hotel ini menawarkan Wi-Fi percuma semua bilik, Wi-Fi di tempat awam, tempat letak kereta, pengangkutan lapangan terbang, khidmat dobi untuk memastikan tetamu menikmati keselesaan yang terbaik. Semua bilik tetamu menawarkan pelbagai jenis tahap keselesaan. Banyak bilik turut menyediakan internet wayarles (percuma), penyaman udara, pemanas, kipas, televisyen untuk memuaskan hati tetamu. Senarai lengkap kemudahan rekreasi boleh didapati di hotel, termasuk kolam renang terbuka, taman. Nikmati perkhidmatan yang sukar ditandingi dan lokasi benar-benar berprestij di Maison Ambre Guesthouse. We stayed at Maison Ambre guest house for one night at the beginning of a two week driving tour of Namibia. 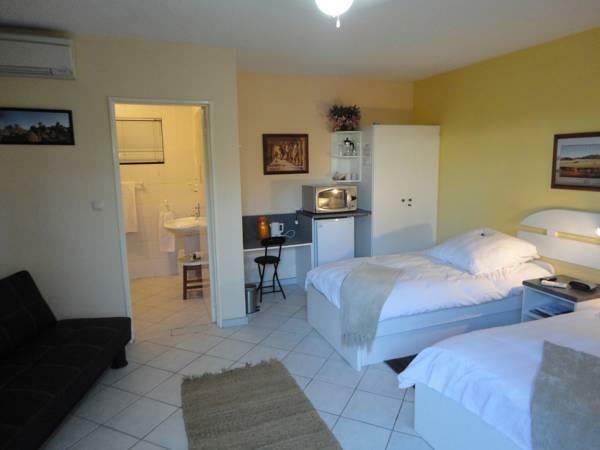 Maison Ambre is conveniently located within safe walking distance of the center of Windhoek. On arrival we were met by the owners and shown to our wonderful suite. The compound is very secure and the villa/guest house is very comfortable. We had just come from 12 days traveling in South Africa so we were in need of laundry services--but since we only had one day in Windhoek, it was nice that the guest house has very efficient laundry services. The breakfast was cook to order and nicely done. The owners gave us very good recommendations for restaurants for dinner within walking distance. The only suggestion for improvement I have is that I could not find a way to directly make a room reservation on the guest house website. In the end I was able to make our reservation through the Agoda booking site and that worked well. In the future I would probably just phone the guest house directly to make reservations as the owners handle the reception and they speak multiple languages fluently. Very nice location. Hosts were very accommodating regarding check out. This is our second stay, as enjoyable as the first time. Nice place, nice staff, nice boss and nice breakfast , recommended ! Fantastic breakfast! Owner Beate as well as Andrea and Willi were very helpful getting us oriented. Very friendly staff! The ambiance of the hotel, the location and the helpfulness of the staff. Fabulous stay, very helpful staff, great location, great ambiance, wonderful breakfast. We booked Maison Ambre for our last night in Namibia. We were very happy with the location and the overall facilities. The hosts went out of the way to make us feel comfortable. Thank you! Though stay was short, it was an excellent experience. Owner's father, Otto, personally came to the airport to pick me up, and also showed me around the contrasts of the Windhoek. Overall, a lovely experience, and I hope to bring the family back someday in the future. Really enjoyed a three night stay at the end of our tour around Namibia, owner and staff were so accommodating and we were made to feel very welcome, we will be back one day! Secure area, very beautiful room with even the option of heating (needed in winter time) , very friendly staff - truly recommended ! I stayed several times in this guest house. My first choice in WDH. The furniture and accommodation is outdated and it feels more like living in someones spare bedroom. The breakfast was great. Our stay at the Maison Ambre Guesthouse was wonderful. The rooms were well cared for, comfortable and had a lovely attention to detail. My travel partner and I ran into some unfortunate luck during our stay in Windhoek, but the owners of the hotel were so caring and considerate. They helped us with all of our needs no questions asked. I couldn't be more grateful. We loved our stay and the kindness of the people is reason enough to stay there. The guesthouse is very clean and spacious and the staff was immensely friendly and helpful. The rooms were spotless and had very friendly designs. The guesthouse is a bit far from everything if you do not have a car though. They were able to arrange a car service but there is nothing in walking disctance. However, a very nice guesthouse with a pool / terrace area and great hosts.